A dust storm measuring 500 kilometres (310 miles) in length is sweeping across Australia's southeast, blanketing towns in a red haze and raising health concerns. Satellite images show the wall of dust roughly the same distance from London to Paris as it moves across New South Wales towards the coast. Authorities issued a public health alert for Sydney on Thursday, rating the air particle quality as very poor and warning children, the elderly and those with respiratory problems to stay inside. Senior forecaster at the Bureau of Meteorology Dean Narramore told CNN affiliate 9 News the dust plume was moving quickly east. "Much of central New South Wales is covered in the dust this morning and we should see that move towards the coast in the coming hours," he said. 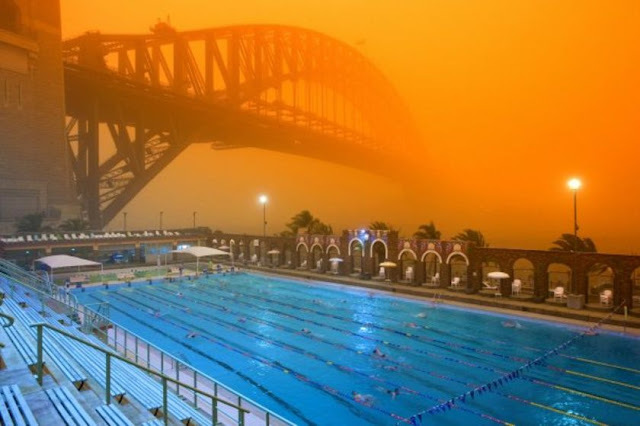 The haze is reminiscent of a massive dust storm measuring 500 kilometres wide and 1,000 kilometres (620 miles) in length that struck New South Wales and Queensland in 2009, turning the sky a brilliant orange. Narramore said the system may not be as large as the previous storm but could still pose health risks. "At this stage, it is not looking as big and intense as we saw in 2009 but we're definitely going to see visibility reduced and the wind picks up," he said. The current dust storm was caused by strong winds ahead of a low-pressure system that picked up masses of loose dust particles, the result of prolonged drought in the state, according to Australia's Bureau of Meteorology. Australia is suffering from one of the worst droughts in living memory resulting in water shortages and failed crops. Farmer's livelihoods have been devastated as grazing fields have turned into dry, barren land. In August, the whole of New South Wales, the country's most populous state, was declared 100% in drought. A month later the country experienced the driest month in more than a century.